This web app maps crowd disasters worldwide since 1950 and includes data on each incident. It was developed by Dr. Ali Asgary, Associate Professor of Disaster and Emergency Management at York University in Toronto, Canada. This app is part of the ADERSIM initiative at York University. Various terrorist scenarios including Active Shooting are amongst the most urgent issues facing the world today. With new threats constantly evolving, planning protection against emerging threats becomes overwhelming. At present, very few organizations (public or private) have comprehensive plans to deal with the potential cases of active shooting, suicide bombing and others. Security forces are not properly trained in the identification of suspicious activity, nor do they understand terrorist’s standard operating procedures. 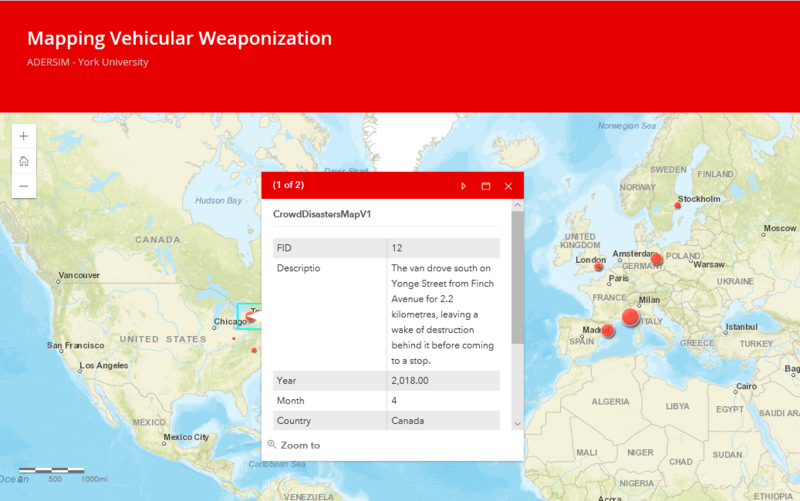 The “North American Active Shooter” web application is a component of the Advanced Disaster, Emergency and Rapid-response Simulation (ADERSIM) initiative, based at York University. The initiative leverages the latest modeling and simulation technology within York’s advanced Disaster and Emergency Management (DEM) Centre. The overarching objective of this project is to enhance disaster and emergency preparedness, response and reporting strategies by public and private organizations in across Canada and around the world. It also helps model threats and vulnerabilities based on human and social behaviour. MySafeRailApp is a Webmap Application developed by Dr. Ali Asgary (Advanced Disaster, Emergency and Rapid Response Simulations-York University) in collaboration with Safe Rail Communities. This project has been funded by the Global & Community Outreach, Faculty of Liberal Arts and Professional Studies of York University. This web map applications visualizes the Urban Heavy Search and Rescue Task Forces operations in Canada and the USA during the past few years. This webmap application maps incidents in which vehicles have been used to harm civilians in urban areas. The App is updated when new incidents occur.